Editor’s note: While Phil Mickelson has now won twice in Los Angeles − back-to-back Northern Trust Open titles − so did “Lighthorse” Harry Cooper more than 70 years ago. In fact, Cooper won the first Los Angeles Open in 1926 and also claimed the trophy in 1937. This is his story. HARRY COOPER IS IN MANY WAYS the forgotten man of professional golf. He never won the Masters, the PGA Championship or the U.S. Open. 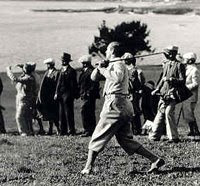 But for three decades, beginning in the Twenties, he played some of the best, and fastest, rounds of golf on the PGA Tour, winning more than 30 tournaments, culminating in 1937, when he won nine times and was both the leading money winner ($14,000) and winner of the Vardon Trophy for the best scoring average. Born in England in 1904, he moved when he was a child with his father, a golf pro, to Texas where he grew up to win the Texas PGA Championship in 1922 and 1923. His first big win, however, was the inaugural Los Angeles Open in 1926. (Cooper won it again in 1937.) It was here that he was nicknamed “Lighthorse” by the famous journalist and short story writer, Damon Runyon. Damon wrote that he needed a racehorse to keep up with Harry Cooper. Runyon, and 5,000 other spectators, raced after Harry and George Von Elm in the final round. It was a round that took just two and a half hours to play. Unable to make a decent living on tour, Harry became a home professional. First in Chicago in the late ‘30s, then Minneapolis, Honolulu at the close of the World War II, and returning to the mainland, at the Lakeside Golf Club in North Hollywood, where he gave lessons to the likes of Bob Hope and Bring Crosby. I met Harry in 1990. He was teaching part-time at the Westchester Country Club in Rye, New York, after having been the pro at nearby Metropolis Country Club for 26 years. I was writing Playing With the Pros: Golf Tips from the Senior Tour (with photos by golf’s renowned photographer Jules Alexander) and Harry was kind enough to pen the Introduction for the instructional book. For those of us who knew Harry, we were lucky. John Coyne is the author of The Caddie Who Knew Ben Hogan and The Caddie Who Played with Hickory. Learn more at John Coyne Books. Great post...his tips are still appropriate today for anyone who seriously wants to play the game on an elevated level. Nobody at the highest level pays any attention to #5 anymore, though. This may change next year when square grooves are outlawed, but it's all a power game now. The game has certainly change a lot since Harry's heyday. “Now this is great advice keeping your head still rather then the over used advice in golf about keeping your eye on the ball"